Oops. Are we not supposed to talk about four letter words? No, not those four letter words. These are words you can say out loud and on regular television, and they won’t get you a trip to the principal’s office. Words like debt, more, high and time. See? Innocent four letter words. It’s the price of a 1.13 carat round brilliant flawless finish diamond or a used 2008 Nissan Pathfinder. It’s also how much the average American household owes in credit card debt (according to NerdWallet.com). Seem like a lot? Yeah, well, swipe and spend is as American as burgers and fries. 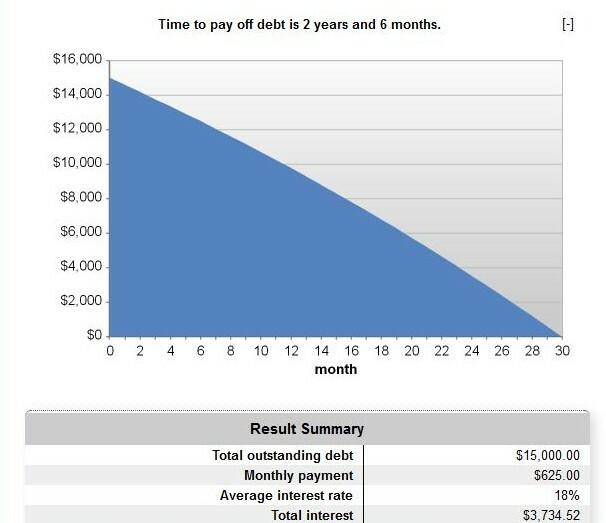 Do you know how long it will take for you to pay down a $15,000 credit card debt? We didn’t think so, which is why we did it for you using this handy-dandy calculator. 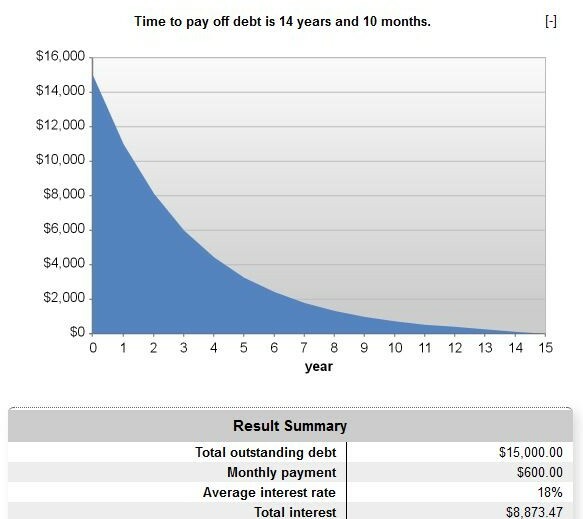 This graph shows $15,000 debt, at 18% APR and only paying the minimum payment. In this instance, the minimum payment is calculated at 4% of the balance, which comes to $600 for the first payment. As debt is paid down, the minimum payment is reduced as well. Wait…that said 14 YEARS. Yes, my friend, it did. Now, let’s add $25 to the minimum payment, which means you are paying $625 per month, and we’ll continue paying $625 until the debt is gone. I don’t know about you, but two years sounds a whole heckavu lot better than 14 years. Fourteen years is twice as long as the average marriage in America. It’s also about how long a kid has been in school by the time he or she graduates from high school. You remember how long THAT was, right? Oh, and did you happen to notice how much you’ll save in interest just by paying $25 more per month? (About $5,000, if you are wondering). One more thing: These amounts are based on the fact that you aren’t ADDING to the debt. So, let’s nip this in the bud. The above shows that by paying a little bit MORE toward your credit card DEBT can be extremely beneficial. Those are the first of your four-letter words! HIGH: Got a card with a high interest rate? Pay off that card first, even if other credit cards have larger debt. And in case you didn’t get it the first time, the more you pay, the quicker the debt goes away. TIME: This is a no brainer. Make your payments on time. Making a late payment could result in a fee. And being 60 days overdue could result in a late penalty fee, which increases your interest rate on that card, and possibly your other cards too! That’s blasphemy! I know, right? But it’s true. Pay on time, people. Debt, more, high and time. Four letter words that can actually get you out of (financial) trouble. This entry was posted in Articles, Statistics, Uncategorized and tagged american household debt 2013, Americans and Credit Card Debt, credit card debt, credit cards, debt, destroy debt, pay down debt on January 29, 2014 by moneypossible.